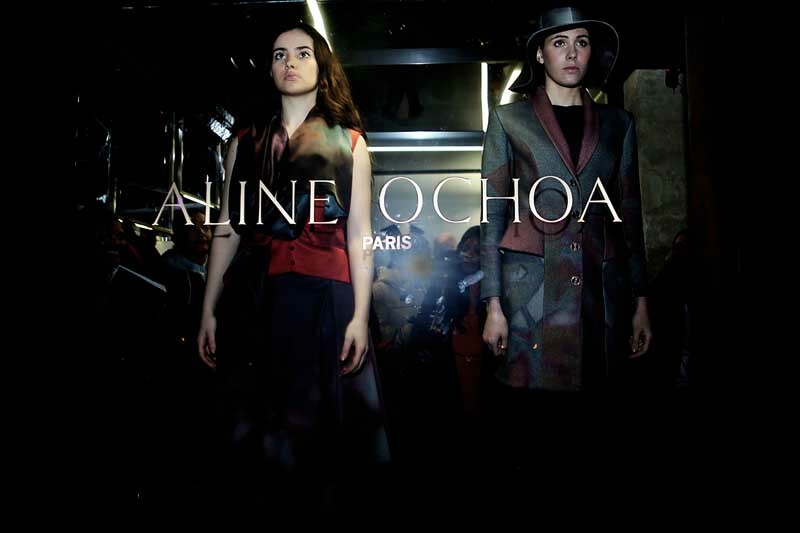 [The Aline Ochoa Fall 2014] collection is about the woods that are on the brink of their seasonal decline. Full of colours that symbolize the energy of life, like red as the colour of blood, yellow as the colour of the sun. Although we know it is hard to imagine when you are in a wood so coloured that in a short time everything will have gone to sleep. We started by doing pictures of leaves in this blast of colours that was surrounding us. It is a blurred crazy dance of embracing and repelling of all this colours; it feels like the woods have one last blast before letting it all go. Left is only a peaceful space of naked trees that are sleeping, waiting and gathering energy for rejuvenation. On the dresses as we see them now the colours are a memory of this experience, a constructed memory that holds the body of our women. It is a colour requiem that holds this memory like a photograph of our past. Its memory of a bygone dance of colourful bliss that lasts just till the next one takes our fancy. The Swiss and Mexican/Columbian duo Aline Barrero Ochoa and Tom Bauer Ochoa founded ALINE OCHOA in 2011. Aline who has worked in major fashion houses such as Yves Saint Laurent, McQueen, Alaïa or Givenchy mixes her expertise with Tom’s visual experience as a photographer giving to all their pieces a strong signature. This Parisian Brand, with atelier based in the heart of the 6ième arrondissement, trust their quality entirely in the “MADE IN FRANCE”; precision in every cut to the highest standard in assembly and materials.